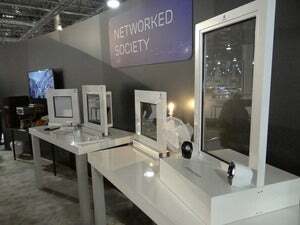 Ericsson may have a contender for oddest networking product if it commercializes the wireless bus windows it demonstrated at this week's CTIA Wireless trade show. The windows would have built-in, translucent antennas connected to an internal Wi-Fi system for passenger use while on the road. 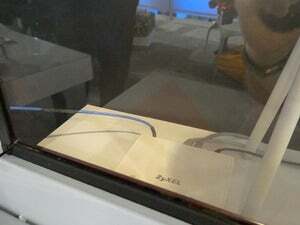 In the example Ericsson showed at CTIA, the dual-band Wi-Fi antenna was just a square of barely visible red metal embedded between layers of glass. The mobile infrastructure giant demonstrated the concept on the upper level of its booth at CTIA, above a showcase of other technologies designed for so-called heterogeneous networks with both Wi-Fi and cellular radios. On Tuesday, the company announced enhancements to its network management software that will allow carriers to do a better job shifting subscribers between the two systems for the best possible coverage. Ericsson's solution had its origin in a problem for wireless users on buses, cars and trains. For insulation and sun protection, some windows are now being built with thin, translucent layers of aluminum sandwiched between glass. Combined with the metal that covers the rest of a vehicle, those windows essentially create a so-called Faraday cage, a box that blocks all outside radio waves, said Bryan Coley, a marketing program manager at Ericsson. Travelers in such a vehicle can't get online using the outdoor cell network, because it's signals are blocked. But Ericsson researchers decided to use the metal-in-glass principle to their advantage by building antennas into the windows along with the insulating metal. Though the window antennas are simple passive antennas, each one reinforces the internal network's signal. The resulting network becomes like an in-flight Wi-Fi system on an airliner. Passengers log in to an internal Wi-Fi network that uses a longer range technology, such as LTE, to connect to the outside world. At the same time, using signal-blocking windows and internal Wi-Fi prevents a situation that can strain outdoor cellular networks and is one of the problems with cellphone use on planes. If an airline passenger turns on a phone, it can cause cell towers on the ground to try to connect with it, diverting bandwidth that could be used by people on the ground. A train full of passengers unknowingly trying to get on cell towers as they speed past can make it hard for carriers to manage traffic. Plus, it can quickly draw down the battery life of the phones as they work hard to grab faint signals, Coley said. The concept could also translate from buses and trains to glass-walled office buildings, he said. In addition to strengthening an interior Wi-Fi network, such antennas could improve coverage and capacity on indoor cellular systems while easing the demands on nearby cell towers that people indoors would otherwise be using.